As a first-generation student, Marli Coonrod struggled her freshman year before learning a valuable lesson. 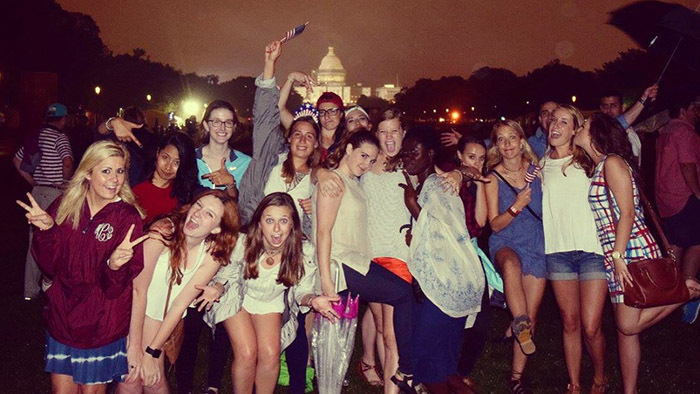 She went from an unconfident freshman to a self-reliant student who has interned in Washington, D.C.
“Like many college students, I want to make my parents proud by achieving a college education, but to me it is so much more than this." Her first year on campus was not a smooth transition. Coonrod is a first-generation student, which means she was the first in her family to attend college. She often found herself not knowing where to search for answers. But the public relations major had determination and drive, and parents who encouraged her to follow her dreams. Her experience inspired her to cofound a group called “MSU: I’m First,” an organization dedicated to supporting first-gen students on campus. During 2016, with support from Dr. Dee Siscoe, Missouri State’s vice president for student affairs, Coonrod was selected for an internship program in Washington, D.C.
She spent two months interning on Capitol Hill. She was unsure at first because she had not traveled far outside of Missouri, but knew she had to take this once-in-a-lifetime opportunity. Down the road, you might have the product of Annina Fremgen's vision in your home. Perhaps the table on which you eat dinner with your family. Annina wants to design furniture. Though Shilpa Mohite grew up in Karad, India, she knew early on that she would attend Missouri State.